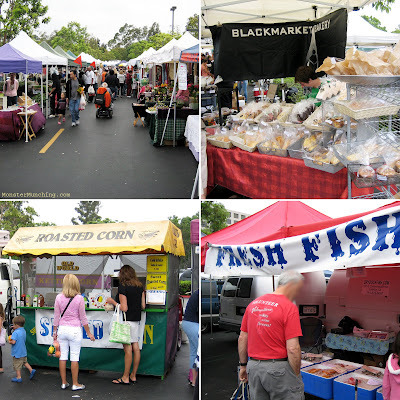 Don't be like me: Don't put off visiting the Irvine Farmers Market. Though I've lived in the city for more than 15 years and was both an undergraduate and graduate student at UCI, it wasn't until last Saturday that I made my pilgrimage. What spurred my sudden resolve? Well, I had to catch an early Saturday morning screening of Food, Inc. at the University Town Center Edwards. It's the only theater in O.C. to show it. And since I was up anyway, I made it a point to flip-flop over to the weekly gathering of local farmers, which takes place on the same parking lot. As it turns out, the film and the farmers' market foray could've been billed as a double feature -- one complements the other. Food, Inc., a muck-racking exposé on the factory food system, scared the bejesus out of me; and the farmers' market suckled me back from depression with proof that there is still some hope left in the world. Here in the embrace of rows upon rows of just-picked produce, I found solace. It's like a mother's soothing voice reassuring you after waking up from a nightmare. It seems to purr, "There there, it'll be alright...here, have a nectarine." But moreover, for people like me, who are zombies to the supermarket produce aisle, the experience is like unplugging from The Matrix. 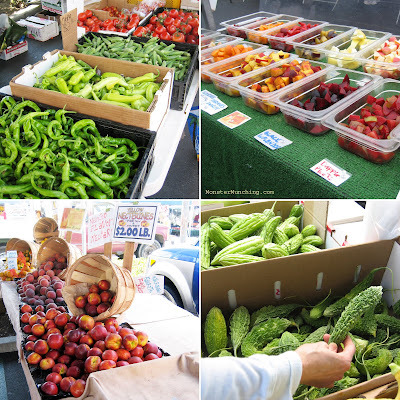 At the Irvine Farmers' Market, reality exists in brighter Technicolor, where sunlight, fresh air and human interaction reign. Here's an example of the later: I stopped by a stall stocked with all the vegetable components to make a Filipino dish I love called pinakbet. 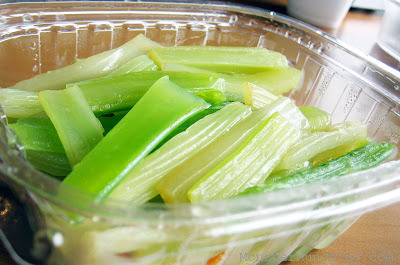 As I was admiring long beans the length of whips and bumpy-skinned bitter melon, the Filipina proprietor started a conversation. I asked her about the ampalaya (that's Tagalog for bitter melon). But since that's about the only Tagalog I speak, she finds out quickly that I wasn't Pinoy, which seemed to make her even more excited that I was interested in it. "Oh! This is great with ground beef! Slice it up, stir fry it with the meat, garlic, onion, and some oyster sauce!" she said. "Should I soak it in salt first to get the bitterness out?" I pressed on. "Oh no. I don't do that. The bitterness is good for you. He eats it raw," she said as she pointed towards her Caucasian husband, who was quietly nodding off in a lawn chair behind her, "it's good for lowering his blood sugar." Then, after I paid her for my haul, she goes over to a bin, grabs an armful of eggplants, and gives it to me for free. "This is for tortang talong," she winks. Think that could ever happen at a supermarket? 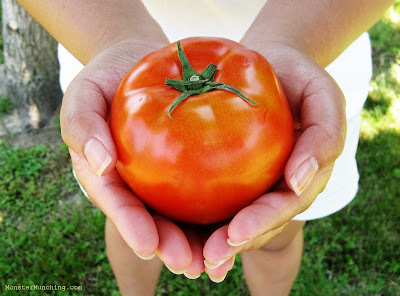 But this gathering is not just about getting to know the people who grow your organic and locally-grown produce. You'll also become acquainted with fresh fish mongers, vendors selling roasted corn on the cob, scratch bakers, even a sausage purveyor. Over the years, this farmers' market has grown to become a large, shapeless amoeba-like maze of vegetable virtue and hand-crafted goods. To find out more about it, read the detailed report by Chubbypanda on OC Food Blogs and the post by Professor Salt wrote on his blog. Whatever you do, just go. Either to this one, which is conveniently held every Saturday (8 a.m. - noon) rain or shine, or the others located all over Orange County. My only other advice: Bring money and sunscreen. It is a bright and sunny world out there. But Thai Cafe was different, more complex, more bold, more everything. If I had to find a way to explain the difference, I'd say it was the location. It took the place of El Conejo, a taqueria that was oddly out of place, surrounded by a burgeoning Asian plaza. Thai Cafe seemed to rise to the expectations that came with the area. We ordered standard, run-of-the-mill, unchallenging dishes to be sure; but all were done very well. 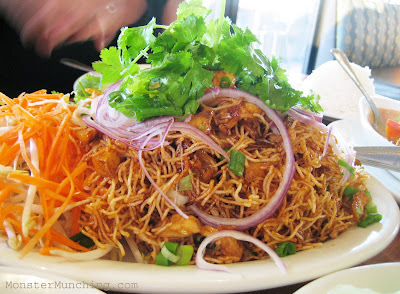 The mee krob ($7.50), a crispy nest of fried rice noodles, towered in a sky high mound, topped with a crowning tuft of cilantro and flanked by fresh bean sprouts and carrots. In the noodle tangle, shrimp, chicken, fried onions, and scallions were suspended inside the matrix with a sticky, sweet and sour glaze. The dish had a surplus of ingredients and flavor. 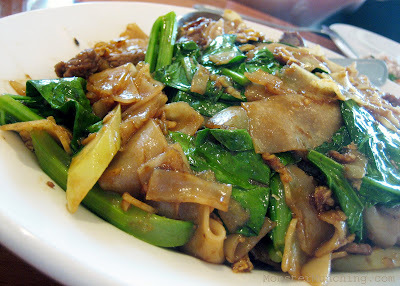 The pad see ew ($9.95) was peppery, and the sweetness of soy thoroughly seeped into the supple noodle sheets. Balancing it out were Chinese broccoli's bitterness and crunch. Their larb kai ($8.95), a cold salad of ground chicken, used too much sugar, not enough lime juice, but the mint grounded what could've been cloying. The beef in the beef panang ($10.95) were tender, sliced against the grain, wading in a caramel-hued gravy that reached its potential when poured over rice and enjoyed like the coconut-tempered curry it is. 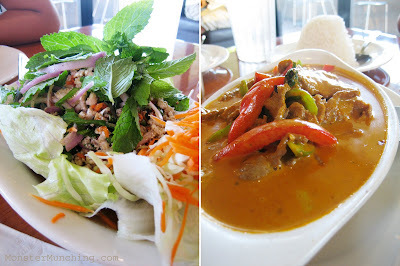 So how does Thai Cafe rank among Orange County's best Thai restaurants? Well, it's still no Thai Nakorn; but it's no Thai Kitchen, if you get my drift. 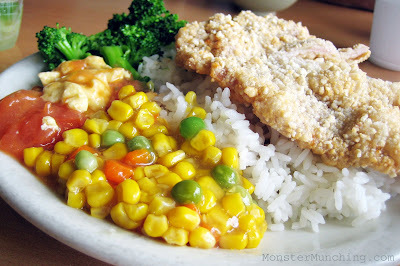 *Special Thanks to Brekkie Fan for the tip on Watermarc. I'm already well into my thirties, but I'm still drinking boba milk tea. Well, not all the time, but for some reason, I'm always keenly aware of myself when I do. I consider boba drinks funnier than anything that has a cocktail umbrella in it. It's because of those oversized straws, the plastic sealed-on tops with the cartoon characters, and the milk tea itself -- a chocolate-milk liquid more apt to be seen in a toddler's sippy cup than in a grown man's beverage. Anthony Bourdain had a boba drink in a not-so-recent episode of No Reservations and he looked damned silly sucking on one -- the culinary equivalent of John Wayne riding on top of a coin-operated mechanical horsey and going "Wheee!" And the capper, of course, are those tapioca marbles. These are the nuclei of the frivolity: Dark-colored, sticky, starchy balls that settle on the bottom of the cup like prayer beads, but serve no purpose other than to be chewed and act as a potential choking hazard. The adult in me can really do without them. These are empty calories I can better allocate to more substantial foods. Also, it's usually the drink that I'm after. But the Asian in me compels my brain to always ask for it. Plus, it's tradition. 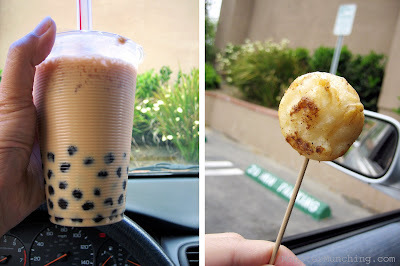 Back in college (damn, that was a long time ago) my friends and I used to drive to Monterey Park from Irvine just to get a boba drink. Nowadays when I hanker for a throwback to those simpler, stupider times, I go to Champion Food Co. in Irvine where they still go through the trouble of assembling the drinks to order. 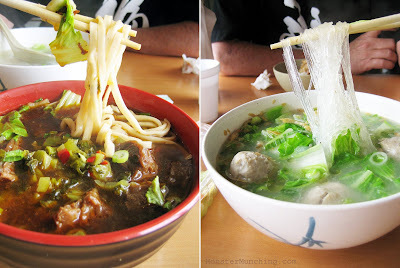 Other purveyors premake the milk tea and ladle it out like soup from a refrigerated trough. The folks at Champion? They're stirring, mixing, doing actual measurements. A squirt of sweetened condensed milk here. A spoonful of simple syrup there. And also, they use crushed ice, not cubes. This makes all the difference. Ice cubes become obstacles, an impedance for your straw to get at that final boba ball. For snacks, Champion offers tea eggs and other things to go with your carb-ladened drink. This time, I ordered something I hadn't seen there before: squid balls. When I did, the gal walked over to the fridge, took out a plastic ziplock bag with five or so golf-ball sized orbs, deposited them to a fryer basket, and then sealed them shut behind the door of a small metal box that had a countdown clock on the front (no, it wasn't a microwave or an oven). What came out of it about a minute later was golden brown, hot, crispy, and presumably not fried, although it sure tasted like it was. The texture was as springy and resilient as an actual squid, except even more so. It seemed hellbent to exact revenge against Nemo (the Captain, not the fish). And on that front it was successful: Each ball was caked in spicy powder, some of which I accidently inhaled through my nostrils (painful). Ah, the folly of adulthood.